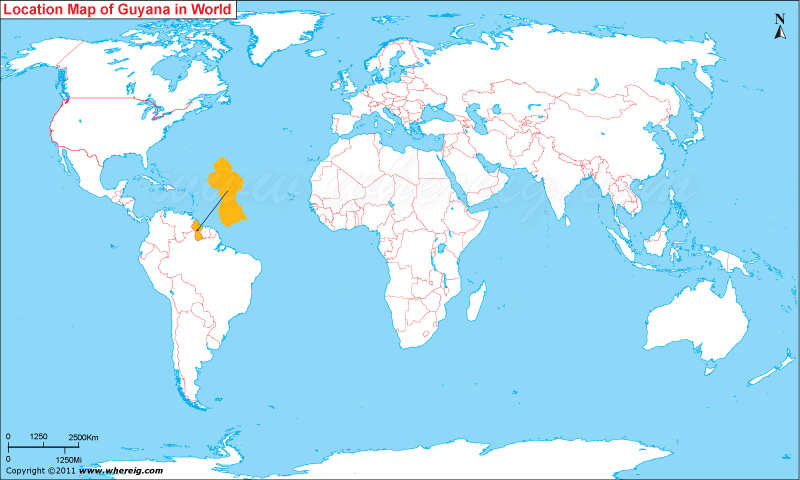 About Map: Map showing location of Guyana in the World. As shown on the location map of Guyana that Guyana is located in the northern part of South America continent and culturally part of the Anglophone Caribbean. Guyana was formerly known by British Guiana because it was the colony of Britain. Hence, it is the only state of Commonwealth of Nations on the continent of South America. Besides, it was also colony of Dutch, French, and Spain. Moreover, Guyana got its independence from the United Kingdom in the year 26 May 1966 and became a Republic in the year 23 February 1970. Interestingly, Guyana is one of the four non-Spanish-speaking countries on the South America continent. The other three are Brazil (Official language is Portuguese), Suriname (Official language is Dutch), and French Guiana (Official language is French). The government type of Guyana is a semi-presidential representative democratic republic where the President of Guyana is the head of government. The politics has multi-party system in Guyana where executive power is exercised by the government. Likewise, the legislative power is remains in the hands of both the government and the National Assembly of Guyana. The climate type of Guyana is tropical generally with hot and humid characteristics. Rains happen in the country two times in the year i.e. first from May to mid-August and second from mid-November to mid-January. Moreover, the agriculture is the main economic activity in Guyana. The important agriculture produce are rice and Demerara sugar. Some of the natural reserves are bauxite, gold and other minerals. Besides, timber, shrimp, and fishing are other major economic activities of the country.